Regardless, what’s the best possible thing you can do with your tax refund? That depends on your personal financial situation. But it’s important for everyone to first remember a tax refund is not a free financial windfall. It’s money you earned and that was withheld from your paycheck by the government. 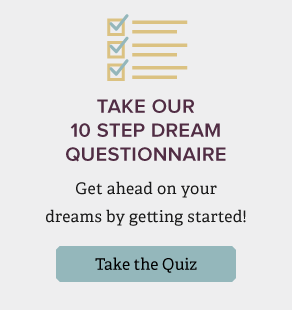 You probably wouldn’t thoughtlessly spend $3,000 from your regular paycheck. So, why do that with these hard-earned dollars? Turns out most people have their financial well-being in mind when it comes to using their tax refunds. 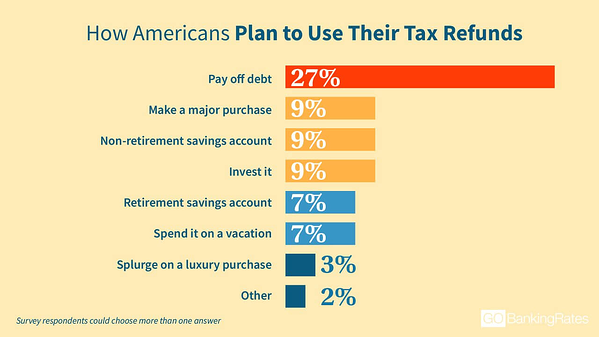 A GOBankingRates survey suggests the top thing taxpayers plan to do with their tax refunds is pay off debt (27%). That makes a lot of sense when you consider the average American has about $38,000 in personal debt, excluding home mortgages. Other popular plans include putting their refund in some kind of savings or investing it. While most taxpayers seem to have their financial priorities in order, 19% say they plan to spend their refund in some way, either on a major purchase or vacation, or to splurge on a luxury purchase. Of course, spending your tax refund isn’t always bad if you’re using it for a major purchase that could provide long-term benefits, such as a home down payment. However, the best thing to do with your refund is to put it toward your most immediate financial needs. Certainly, if you’re carrying high-interest credit card debt, make that a top priority. Another high priority should be building an emergency fund. A Federal Reserve Board report found that 40% of Americans can’t cover an unexpected $400 expense. Ideally, you should have enough saved to cover 3-6 months’ worth of expenses, which will help you financially cope with events like a medical emergency or job loss. For those who don’t need the money right away, there are a variety of ways to get the most out of your refund. Here are some of your savings options, each with their own advantages and disadvantages. If you want to stash away your refund in a safe place that you can quickly access, then a basic savings account may be the way to go. The downside is that you can’t expect to earn much interest. The current national average is 0.10%, according to data from Bankrate. That means a $2,899 refund would only grow by $14.52 after five years. Online banks generally offer much higher interest rates. Some online savings accounts offer rates topping 2%. If you don’t care about having the ability to visit a physical branch, then this is a better option. After 5 years, the funds in one of these accounts could earn $301.73. Money market accounts typically give you higher interest rates than a traditional savings account. You can find accounts with rates as high as 2.35%. In one of those MMAs, your refund would grow by $357.02 after five years. Another advantage of an MMA is that it somewhat works like a checking account in which you are provided checks and sometimes even a debit card. However, you’re often limited to only six transactions per month. You can earn more interest by putting your refund in a certificate of deposit (CD). What rate you earn depends on the financial institution you choose, so it helps to shop around. It’s not rare to find five-year CD rates upwards of 3.10%. After five years, that’s $478.08 in earnings. However, consider a CD only if you won’t need the money for a while. You may be subject to a penalty if you withdraw money prior to the CD’s maturity date. If you are free of credit card debt and have an emergency fund, why not let your refund work for your retirement? Investing your refund is arguably the best money move you can make. Compared to a savings account, an individual retirement account gives you a much greater opportunity to grow your money over time. An IRA is one of the most effective ways to save for retirement, as the money can grow tax-deferred. Even if retirement is right around the corner, putting your refund into an IRA could net you $980.52 in five years, assuming a 6% return. That’s enough for one or two plane tickets around the U.S. Left untouched for 10 years, your refund could earn you an additional $2,292.67. 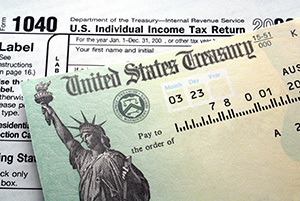 Taxpayers who are early in their careers would see the most benefit by investing their tax refunds. After 20 years in an IRA, your refund could grow by $6,398.49; in 30, it could generate $13,751.38 in earnings. This is a good example of the power of compounding. Keep adding more to your IRA and you earn much more for retirement. Not carelessly spending your hard-earned money is always a good financial decision. That’s why your tax refund shouldn’t be treated as free money. Rather, look at it as an opportunity to improve your financial well-being, such as pay off debt or build an emergency fund. If you don’t have an urgent need for the money, choose to save or invest it. You can never go wrong with saving money. But investing your return instead of simply saving it could make a much greater difference in your life later in retirement.